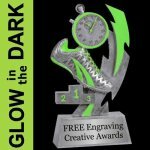 This GLOW in the DARK Track trophy will be a big hit. 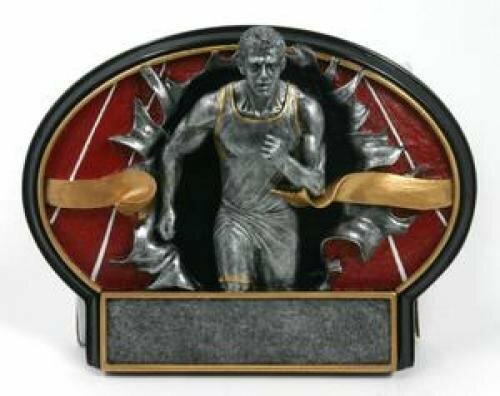 The Track award has an antique pewter finish with yellow accents. Expose it to light and then turn off the lights for a GREEN GLOW! 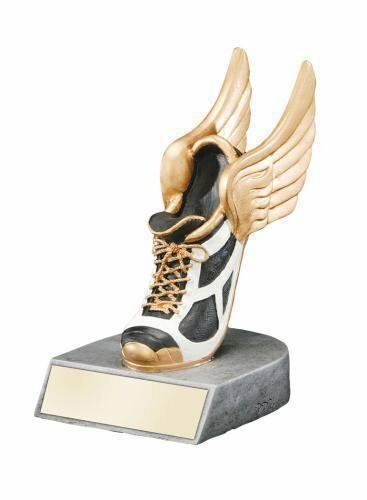 These Track trophies are economically priced and a lot of fun. It comes with a brushed silver plate and black laser engraved letters. 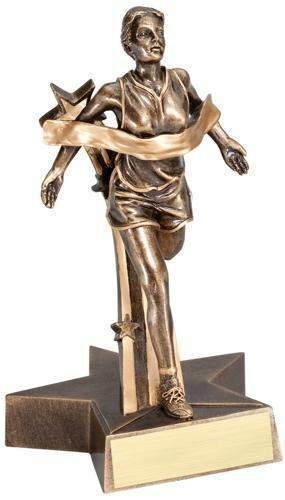 The Radiant Track Trophy is a resin award with stars and a great deal of character. This resin trophy includes a brushed gold plate with up to 3 lines of black engraved letters. This Track Plack is a cherry finished plaque has a black brass plate with a track theme. 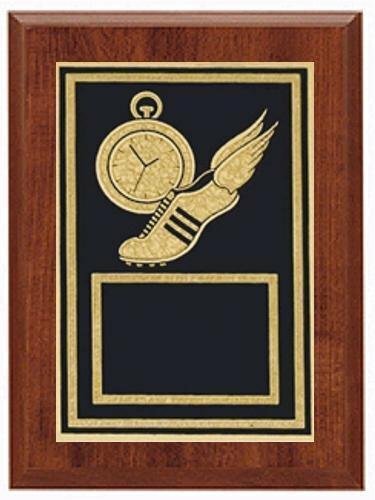 The track plaque is an elegant, yet affordable award that can be used for track competitions or to celebrate individual accomplishments. These award plaques are laser engraved. 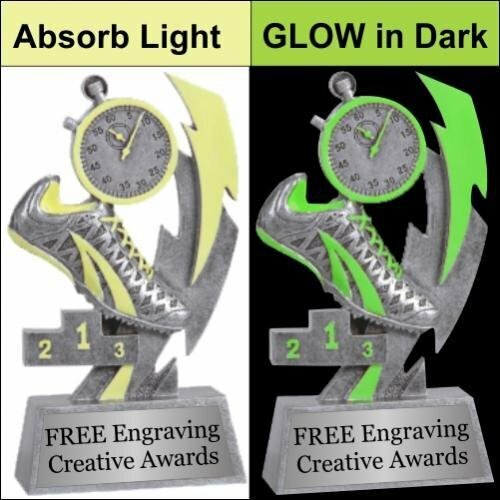 Your logo can usually be engraved on these wall plaques at no additional cost provided that vector artwork or a high quality black and white image is uploaded during checkout. 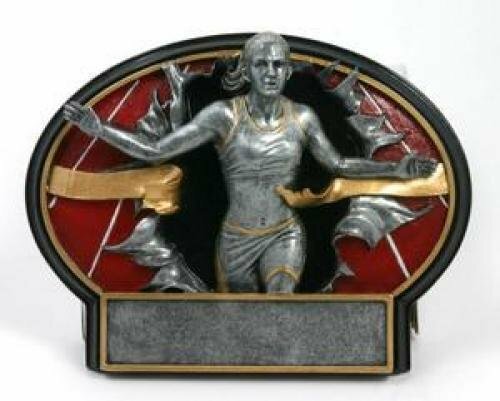 The Burst Thru Track Trophy (Female) is a popular choice. 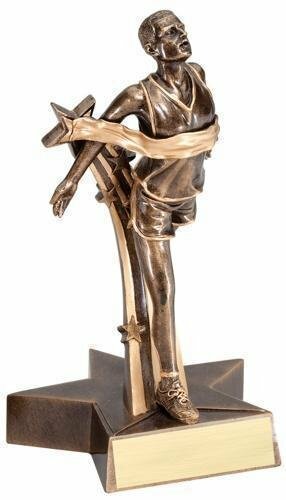 This track trophy can stand alone or be hung on the wall. The resin trophy includes a brushed silver plastic plate with up to 3 lines of black laser engraved letters. 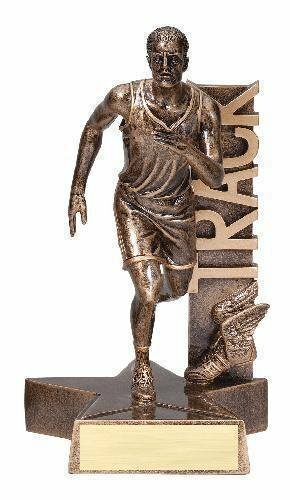 The Burst Thru Track Trophy (Male) is a popular choice. 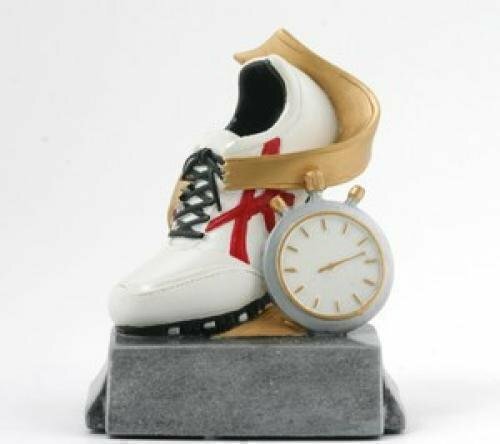 This track trophy can stand alone or be hung on the wall. The resin trophy includes a brushed silver plastic plate with up to 3 lines of black laser engraved letters. 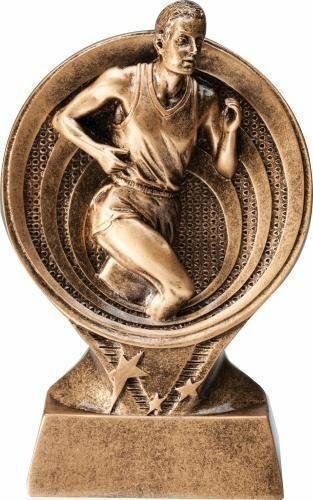 This Action Track Trophy (Male) has a very upbeat design. 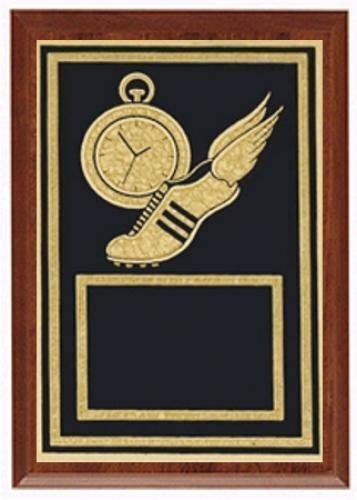 The track award comes with a brushed gold laser engraved plate. 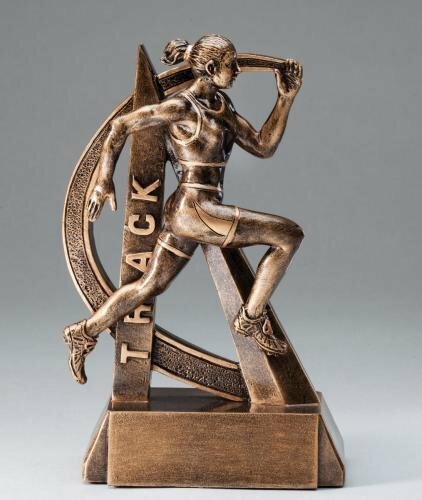 This Billboard Track Trophy (Female) is mounted on a star base. 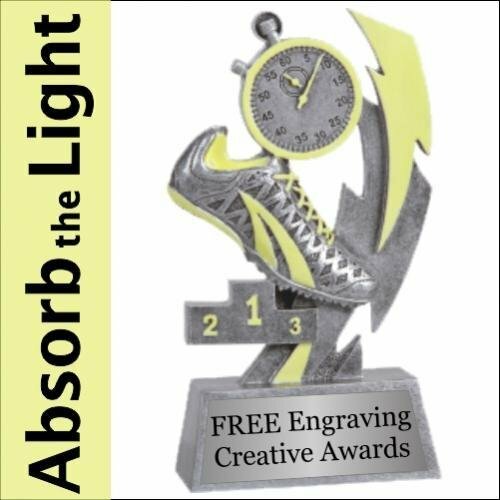 The track award comes with a brushed gold laser engraved plate. 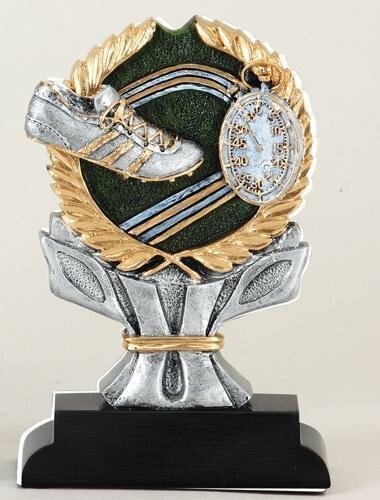 This Billboard Track Trophy (Male) is mounted on a star base. 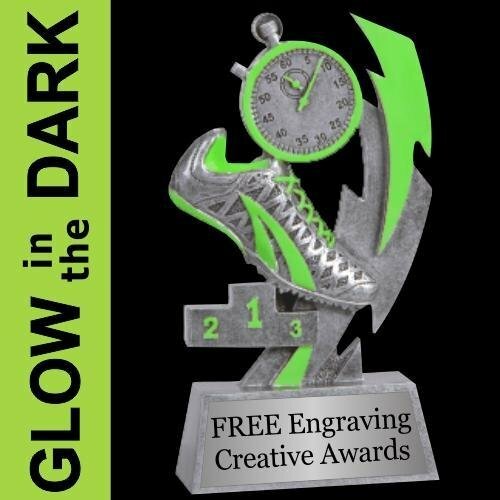 The track award comes with a brushed gold laser engraved plate. 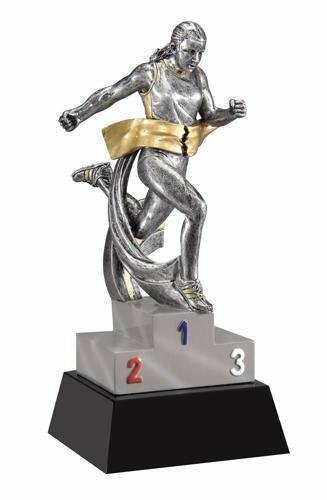 The Saturn Female Track Trophy design puts fun trophies in a new orbit. 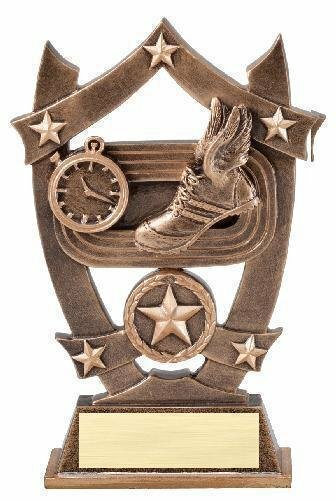 Give these track awards to commemorate a fun season or celebrate achievement. 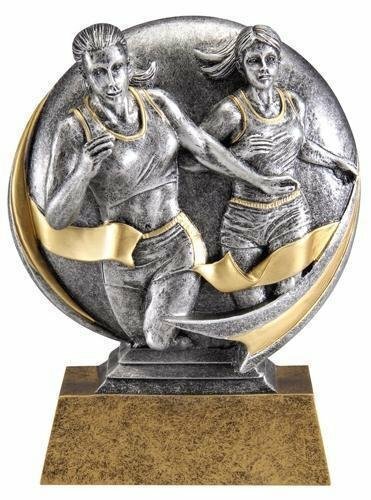 These female track trophies are an economically priced. Each track award comes with a brushed gold plastic plate with laser engrave black lettering. 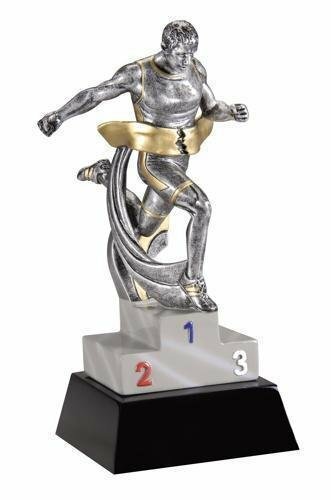 The Saturn Male Track Trophy design puts fun trophies in a new orbit. 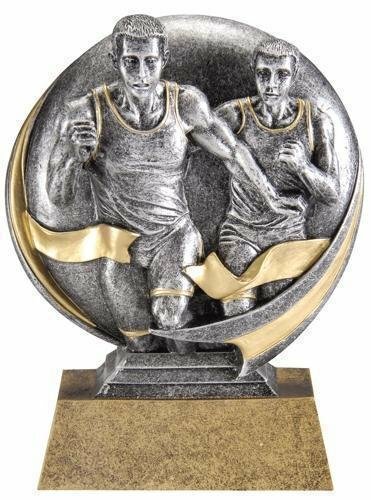 Give these male track awards to commemorate a fun season or celebrate achievement. 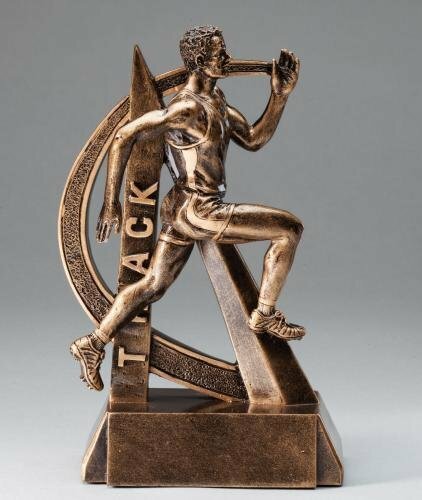 These track trophies are an economically priced. Each male track award comes with a brushed gold plastic plate with laser engrave black lettering. This Stars Track Trophy has a very upbeat design. The track award comes with a brushed gold laser engraved plate. The 3D Motion resin track trophy has a brushed gold laser engraved plate with black letters. 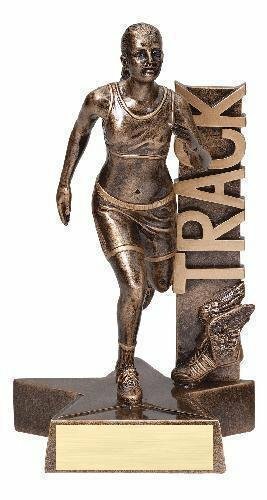 This female track award is an inexpensive trophy with great character. The 3D Motion resin track trophy has a brushed gold laser engraved plate with black letters. 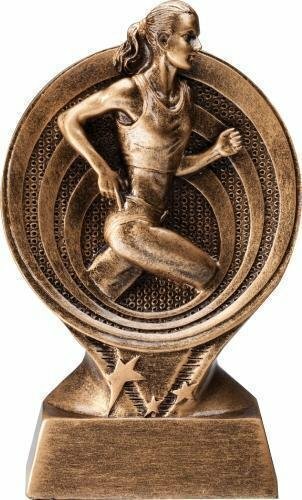 This male track award is an inexpensive trophy with great character. The Ultra Action Track Trophy resin has an antique gold finish. The trophy includes a brushed gold plate with up to 3 lines of black engraved letters. 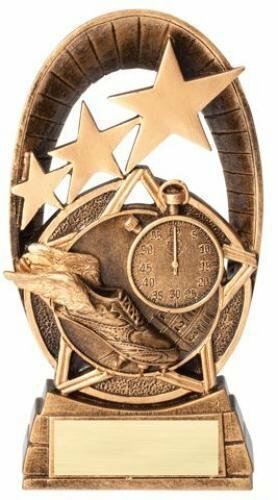 This track award is an inexpensive trophy with great character.